Any of the minute fingerlike projections of the fetal chorion that contain fetal blood vessels and that combine with maternal uterine tissue to form the placenta. any of the tiny vascular fibrils on the surface of the chorion that infiltrate the maternal blood sinuses of the endometrium and help form the placenta. pl. 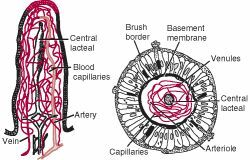 villi [L.] a small process or protrusion, as from the free surface of a membrane. microscopic projections of the arachnoid into some of the venous sinuses. Called also arachnoid granulations. threadlike projections originally occurring uniformly over the external surface of the chorion. multitudinous threadlike projections covering the surface of the mucous membrane lining the small intestine, serving as the sites of absorption of fluids and nutrients. slender projections from the surface of the synovial membrane into the cavity of a joint; called also haversian glands. Prediction of miscarriage and stillbirth at 11-13 weeks and the contribution of chorionic villus sampling. Outcome of 1,355 consecutive transabdominal chorionic villus samplings in 1,351 patients]. Achievement of that goal will reduce appreciably the numbers of invasive prenatal diagnostic procedures and potentially banish the techniques of amniocentesis and chorionic villus sampling to the history books. 9) Despite the decrease in HIV transmission with antiretroviral cover, procedures that require more technical skills--such as chorionic villus sampling and cordocentesis--should still be avoided in the HIV-infected woman, as the risk of transmission to the fetus may be considerably increased. randomized comparison of amniocentesis and trans abdominal and transcervical chorionic villus sampling. Discordant direct and cultures results following chorionic villus sampling and the diagnosis of a third cell line in the fetus. The ACOG guidelines also recommend that women found to have increased risk of aneuploidy based on this screening should be offered genetic counseling and the option of chorionic villus sampling (CVS) or second-trimester amniocentesis. Previously, the only way to know if a woman was having a baby with Down's was with second-trimester blood tests and/or invasive amniocentesis or chorionic villus sampling (CVS) tests, all of which carry a slight risk of miscarriage. The test is not diagnostic and a positive result is usually followed up with a diagnostic amniocentesis or chorionic villus sampling test. About three in five had undergone amniocentesis or chorionic villus sampling; chromosomal abnormalities were the most common indication for pregnancy termination. The definitive antenatal screening tests for Down's syndrome are amniocentesis or chorionic villus sampling (CVS).